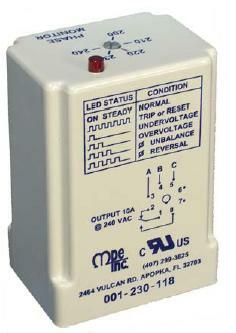 MPE Phase Monitors - B&M Technical Services, Inc.
Three phase motor protection. When proper voltage is connected to the phase monitor, the internal relay will be energized and the LED will come on steady. An abnormal condition will cause the LED to blink during the trip delay. When the trip delay has expired the internal relay will be de-energized. The LED will then provide a series of pulses that indicate which fault condition is present. When conditions return to normal, the LED will blink during the reset delay. When the reset delay has expired, the LED will come on steady and the internal relay will be energized. The reset delay is also active immediately after power is turned on to the unit. These units can be used on Delta or Wye systems, 50/60 Hz. Neutral wires are NOT required. When proper voltage is connected to the phase monitor, the internal relay will be energized and the LED will come on steady. An abnormal condition will cause the LED to blink during the trip delay. When the trip delay has expired the internal relay will be de-energized. The LED will then provide a series of pulses that indicate which fault condition is present. When conditions return to normal, the LED will blink during the reset delay. When the reset delay has expired, the LED will come on steady and the internal relay will be energized. The reset delay is also active immediately after power is turned on to the unit. These units can be used on Delta or Wye systems, 50/60 Hz. Neutral wires are NOT required. The Dual Voltage Phase Monitor automatically selects which voltage-scale to operate from, either 200-240vac or 425-525vac. When proper voltage is connected to the phase monitor, the internal relay will be energized and the LED will come on steady. An abnormal condition will cause the LED to blink during the trip delay. When the trip delay has expired the internal relay will be de-energized. The LED will then provide a series of pulses that indicate which fault condition is present. When conditions return to normal, the LED will blink during the reset delay. When the reset delay has expired, the LED will come on steady and the internal relay will be energized. The reset delay is also active immediately after power is turned on to the unit. These units can be used on Delta or Wye systems, 50/60 Hz. Neutral wires are NOT required.